On the broadest scale, certain forms of vegetation occur again and again, scattered between different places around the planet. Depending on how finely you might choose to subdivide them, there are between five and twenty fundamental vegetation types in the world. They include, for example, tropical rainforest and savanna in the tropics, and in the high latitudes temperate forest and steppe. Such broad-scale vegetation types are known as "biomes", and each one of them is distributed between several continents (Figure 2.1a*). The distribution of biomes is not random—it depends mostly on climate, although underlying rock and soil type and local drainage conditions also determine the precise limits of each biome. 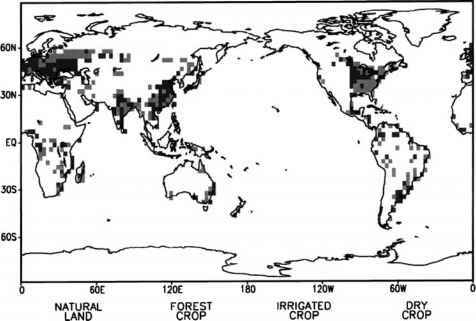 Humans have also influenced the vegetation through burning, forestry and agriculture, so that in some places one finds that a biome has been reduced or shifted in area in response to human disturbance during the last few thousand years (Figure 2.1b*). Exactly how broadly or narrowly a biome is defined can vary between one ecologist and another. 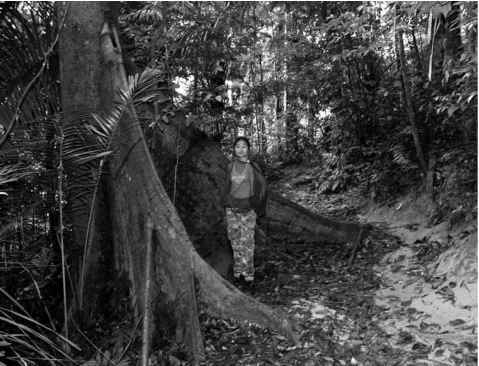 For instance, most ecologists would define all the world's tropical evergreen forests (tropical rainforests) as a biome by itself, but others would also tend to lump this and various other types of tropical forest into a single larger "tropical forest'' biome. Some would even include all forests—anywhere in the world—as part of a grand "forest" biome. Each biome is made up of thousands of individual plant species. Although tending to fit in with the general growth pattern and appearance of the biome, each of these species has its idiosyncrasies. A species also has its own distribution pattern, determined by its specific requirements for climate and soil, and also the chance legacies of history. * See also color section. Figure 2.1. (a) Map of major biome distributions. This is for "natural" vegetation as it would be without human disturbance, based on what we know of broad climate-vegetation relationships. The categories vary somewhat between different authors and so show up differently on different maps. Source: Chase et al. (2000). 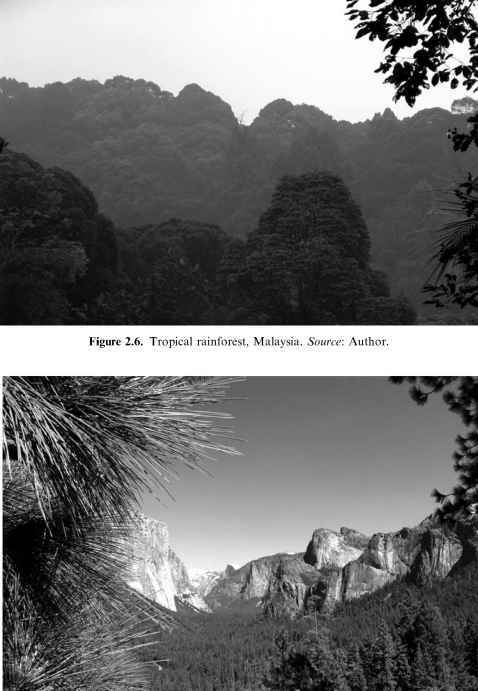 In this chapter we will explore the ways in which climate selects and shapes vegetation, both in its general form (as in a biome) and in the detailed appearance and composition of species within it. Then, in the next chapter (Chapter 3) we will take a look at how vegetation can move if the climate changes. Figure 2.1. (b) Areas of the most intense human alteration of vegetation. Agriculture ("dry" croplands that depend on rainfall, plus irrigated croplands watered by farmers) is extensive. In some areas there is a mixture of croplands and forests regularly harvested on a rotational basis: this is shown here as "forest-crop". Source: Chase et al. (2000). and allowed others that had the right features to survive. By this mechanism, plants from many different lineages have evolved to "suit" the climate, often in quite subtle ways. One example that can be used to illustrate the link between form and function in vegetation is the tropical rainforest biome, which is scattered across several landmasses close to the equator. The distribution of tropical rainforest closely follows the equatorial climate zone with year-round rain and warm conditions, occurring in the Amazon Basin, in central Africa, central America and South-East Asia (Figure 2.1a*). If you were placed in tropical rainforest anywhere in the world, it would look much the same, even though many of the groups of plants are quite different between the regions. This overall resemblance occurs because similarity in climate has selected for various features of the vegetation; evergreen forest with hard glossy leaves, "buttress" roots on the trees that splay out near the ground, an abundance of climbing vines in the forest, and leaves with elongated ends known as drip tips. Another characteristic of tropical rainforest is the presence of epiphytes—plants which grow perched on the branches of large trees. Close similarity in the vegetation between different lands is true within each of the biomes, and it occurs because plants require the same characteristics to exploit the opportunities and survive the challenges presented by the climate. Figure 2.2. Buttress roots in a tropical rainforest tree. Source: Author. For example, in the tropical moist climate, the soil is often soggy with rain, and the clays that form in tropical soils tend to be particularly slick when they are wet. The intense chemical breakdown of rocks in the warmth and the damp (a process known as chemical weathering; see Chapter 7) tends to give deep soils without any layer of rocks near the surface which the trees could hold onto with their roots. Hence the trees need extra anchorage to avoid falling over in these slippery conditions. The evolutionary response to these unstable soil conditions has been buttress roots— splayed out trunks (Figure 2.2*) that resemble the buttresses on the side of a medieval cathedral. But, instead of propping up the tree, as buttresses on a building would do, these act as points of entry for wide-set roots that anchor the tree more effectively into the ground, much as the ropes on a tent would do. 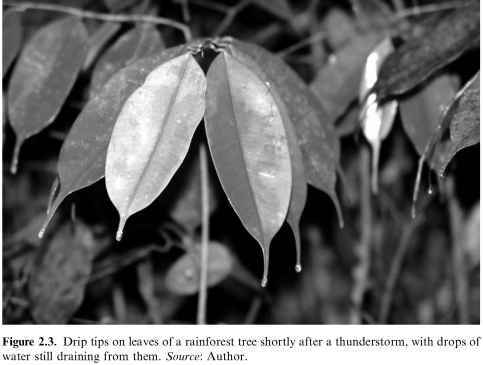 Long drawn-out tips to the leaves are another very common feature that has a function in the climate of the tropics (Figure 2.3*). Where it rains frequently, the surface of a leaf often accumulates in a layer of water. Since the rainforest leaves are long-lived, often lasting three or four years, if leaves stayed wet over time they would accumulate fungi and lichens that would eventually choke the leaf. The answer to this problem is to drain the water off a leaf each time it rains, and these drip tips (as they are known) help this by concentrating the weight of the surface water down to this central point until its tension breaks and it drips or trickles away. Figure 2.3. Drip tips on leaves of a rainforest tree shortly after a thunderstorm, with drops of water still draining from them. Source: Author. Epiphytes (Figure 2.4*) occur in the tropical rainforest because of the high humidity and frequent rainstorms. A plant that grows perched high on a tree branch has not got much to root into, usually just some rotted leaf litter and moss. So the supply of water around its roots is very precarious. Only in a very moist environment, where it will be re-supplied with water every couple of days, can such a plant survive. In other parts of the world outside the equatorial zone, there are different climatic combinations of hot and cold, wet and dry. Similar sets of conditions result in similar types of vegetation. Even though the particular plant species found in the various parts of a biome may be unrelated, they look and behave similarly to one another. This is because natural selection has pressured them in same direction, by selecting plants which had the "right" features, and killing those that did not. Figure 2.4. An epiphyte growing on a tropical rainforest tree. Source: Author. 1. There is a set of "forest vegetation" biomes, which have a dense, closed canopy of trees. 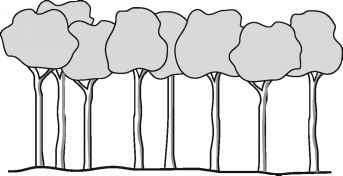 If you stand and look upwards in a forest, you see few large gaps between the crowns of the trees, which tend to overlap and interlock with one another. Forest biomes include tropical rainforest, temperate evergreen forest, temperate deciduous forest, and cold climate conifer forest (also called "boreal conifer" and "taiga") (Figures 2.5a, 2.6*, 2.7*, 2.8*, 2.9*). 2. "Woodland" biomes are rather like forest but with a more open canopy, with significant gaps between individual trees so that their crowns often do not touch. These include Mediterranean woodland, tropical dry woodland, and boreal woodland. 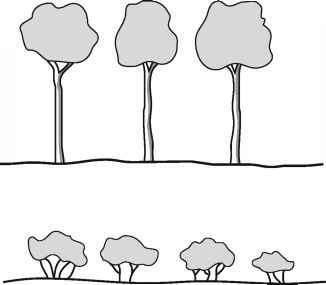 A typical sort of definition of woodland would be that less than 70% of the canopy above is trees, with the rest being open sky (Figure 2.5b). 3. "Shrub" or "scrub" biomes have low woody plants, usually with a rather gnarled appearance and multiple stems instead of a single trunk. They include temperate semi-arid scrub, tropical semi-arid scrub, Mediterranean scrub (garrigue) (Figures 2.5c, 2.10*). 4. "Grasslands" look rather like a lawn or meadow—both of which are human creations—except that these are natural, not cultivated. For example, in the category of grasslands there are the savannas in the tropics, steppe or prairie in the temperate zones, and grassy tundra in very cold climates. Sometimes there may be an open scattering of trees or shrubs (Figures 2.5d, 2.11*, 2.12*). Figure 2.8. 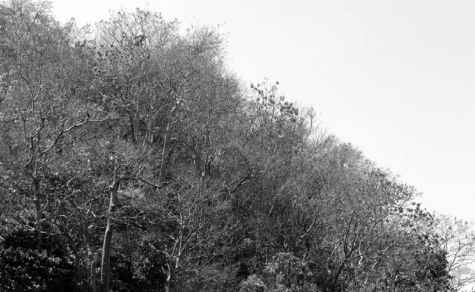 Semi-deciduous forest during the dry season, with some trees leaf-less, Malaysia, near Thai border. Source: Author. Figure 2.9. Tropical montane forest with a cloud layer blanketing the upper parts of the forest, Sabah, Borneo. Source: Author. Figure 2.11. Grassland, California. Source: Author. Figure 2.12. Tundra, above tree line in the Andes, Chile. Source: Margie Mayfield. 5. "Desert" biomes are distinguished mainly by lack of vegetation, with differing degrees of openness, or even no vegetation at all. 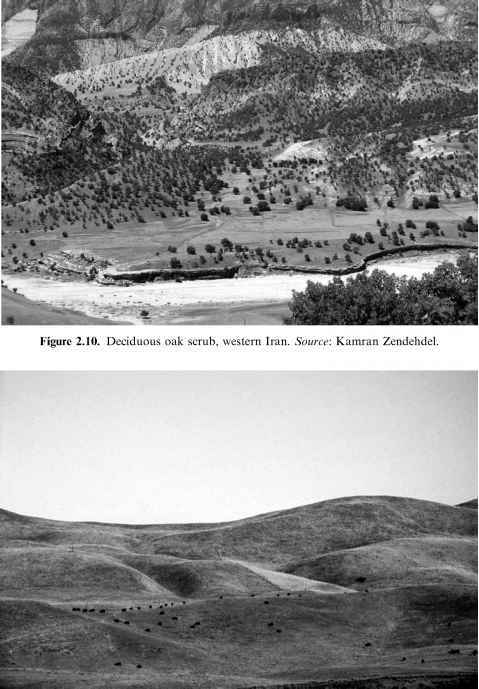 Semi-desert is a sort of transitional open scrub or open grassland, whereas "true" desert has almost no vegetation. People tend to imagine that most deserts are sandy—in fact, more often they are covered by stones or bare rock (Figures 2.5e, 2.13*, 2.14, 2.17*, 2.19). For more detailed study, these vegetation types are subdivided by ecologists in many different ways, using more specific definitions. It is important to realize that while all of the boundaries are really rather subjective (since vegetation types tend to fade into one another on the broad scale) they are nevertheless useful. It is interesting to think about the reasons for the differences and similarities in vegetation structure between different climate zones. These patterns reflect the ecological and evolutionary selection forces on plants, working in consistent ways over large areas, and in different parts of the world. Figure 2.14. Semi-desert, Iran. Source: Kamran Zendehdel. For example, we can start by asking "why is it that some areas of the world naturally support forest, whereas others only support shrubland or grassland?" 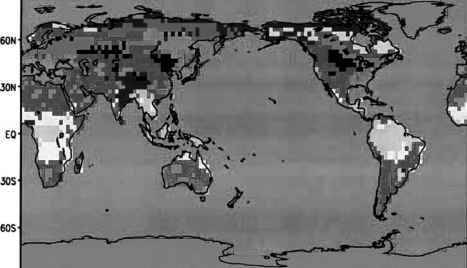 Across nearly half of the world's land surface, the original vegetation is forest. In some places it is easy to tell that forest is the natural vegetation because the landscape is still covered by it. For example, the eastern USA and southeastern Canada are at present mostly forested. Even areas in eastern North America that are kept as farmland will go back to forest if left for several decades. Within just a few years an abandoned field will become covered with tree seedlings that have dispersed in from patches of forest nearby. In other parts of the world, it is not always so easy to tell what the natural vegetation would be like. In northwestern Europe, eastern China and Bangladesh, for example, a high human population density and intensive agriculture have removed almost all the natural forest cover in many areas, particularly in the fertile, flat lowlands that are most desirable for farming. In parts of northern Europe and eastern China there is barely a patch of forest in sight, except perhaps a few scattered plantations of poplars all planted in rows. Nevertheless, where the landscape is hilly and difficult to farm, forests are abundant even in these regions, indicating what the lowlands would probably look like if they were not now under cultivation. 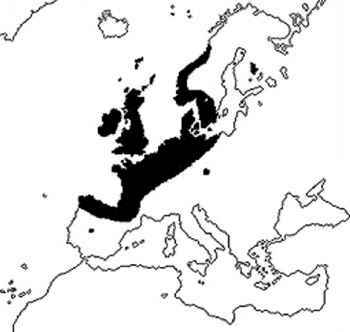 And we have independent corroboration from the pollen record dug up in the mud of lakes and back-swamps; this shows, for example, that up until a few thousand years ago all the most densely inhabited areas of Europe and China were densely forested. However, there are many other parts of the world that are presently almost treeless and could not support forest, even before human interference. This is because the climate is simply unsuitable for a dense tree cover. To have forest one needs two things: (1) enough warmth and (2) enough water. Below a certain threshold of temperature or water availability, the only plants that can survive are low shrubs or herbaceous plants. So trees need more warmth and moisture than other growth forms of plants such as low shrubs and grasses. In places with a mean summer temperature less than about 7 or 8°C, trees cannot grow in the wild, although they can sometimes survive if they are pampered by humans and protected from competition with other smaller plants. Cool summers prevent trees from growing beyond a limit known as the "tree line'' in the Arctic of Siberia or Canada, or in high mountains around the world. Even if a place has quite mild winters but very cool summers below about 8°C it will not have any wild trees, proving the point that it is summer temperature not winter cold that prevents trees from growing. One example is the Faeroe Islands in the north Atlantic, with their cloudy cool oceanic climate. Why is it that trees do badly in cooler summer conditions, when many small shrubs and herbaceous plants can do just fine? 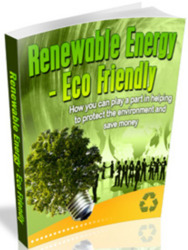 Possibly the problem for trees is that they are in a sense relatively inefficient at growing. They put aside a lot of their energy into woody tissues. They are essentially in for the long haul, to overtop competitors and then reproduce. In many climates, this strategy pays off and trees dominate the landscape. But if conditions are always fairly cool, trees cannot photosynthesize fast enough to sustain basic living processes and also put aside materials into wood. Under such circumstances, their ambitious strategy is rather like trying to pay a mortgage while on a student income! The result of these competing demands is that the trees will simply fail to grow, or they grow so slowly (because they are trying to lay down wood) that the smaller faster-growing shrubs and herbs they are competing with kill them off. This is why tundra (low shrubs and grasses) extends into colder summer temperature zones than the most cold-tolerant boreal (high-latitude) forests. An additional possible reason why trees cannot grow in cold summers is that the actual biochemical process of laying down woody tissue itself requires higher temperatures, although exactly what step in this mechanism might need the extra warmth is not clear. A further reason that trees are replaced by shrubs in cold climates is that shrubs are better at "holding in'' the heat from the sun on a cold day. A tree has a loose growth pattern that allows the wind to blow through it and carry heat away; whereas the dense mass of branches of a shrub holds in heat against the wind (more on this in Chapter 4 on microclimates). The tree growth form drops out sooner along a temperature gradient in certain specialized habitats. In the tropics, in places where mud brought down by rivers accumulates along a shoreline, there are usually mangroves—trees from various evolutionary lineages that are adapted to grow in the salty mud. They need special salt-excreting glands to prevent salt building up in their tissues, and prop roots that prevent the trees from falling over in the soft mud. Yet, whereas mangroves are almost ubiquitous on muddy shores in the tropics (at least when not cleared away by humans), they die out in the subtropics. At mean annual temperatures cooler than about 20°C, there are no mangrove trees and their place is taken by low shrubs, reeds and small herbaceous plants—a vegetation known as salt marsh. Why are there no mangroves in cooler climates, when trees can grow easily on land and further inland in freshwater swamps? Most likely this temperature limit has something to do with the need for a mangrove tree to continuously adjust its anchorage to cope with wave action and the erosion and shifting of mud beneath its roots. In climates that have cool climates, tree growth stops in winter but the wave action and movement of mud does not. Thus, any tree that tried to grow as a mangrove in a climate with a winter would lose its footing and be washed away. In the marine shoreline habitat, the temperature limits on the tree growth form are different because of the peculiar demands of this environment. Figure 2.15. A tree's large area of leaves (a) places a high demand in terms of evaporation, which must be supplied from the soil underneath. A shrub (b), with its much smaller leaf area, loses less water by evaporation so it is much better able to survive in a dry climate where there is not much water in the soil. large—their strategy in life being to overtop and out-compete other plants. They need more water than shrubs and grasses because they have a lot of evaporative leaf area that is essentially placed on top of a single pole, the trunk (Figure 2.15). Plants are limited in how much water their roots can take from the soil underneath them where they are growing, and the bigger the top parts of a plant, the more likely it is to run out of water. So in an arid environment although the tree may start to grow during a rainy spell, it eventually dies when its water supply runs out during a drought period. A low shrubby plant has fewer leaves that evaporate water, relative to the size of its root system and relative to the patch of soil it is rooted into. Thus it makes less water demand on its own area of soil, and it is less likely to die of drought. The result is that along a line of decreasing annual rainfall, forest disappears way before scrub and grasslands do. So in climate regions beyond the drier and colder limits of forest and woodland biomes, the problem for trees is that they are in a sense "too ambitious'' in trying to grow big and overtop everything else, even though this pays off for them in climates which are warm and moist enough. If fires or grazing are frequent, this can kill off the trees too. Trees cannot easily survive having their expensive top parts bitten or burnt off; they are most susceptible when they are seedlings or saplings—replacing old trees that have died off, or trying to establish in open habitat. Low shrubs can easily re-grow their relatively flimsy inexpensive branches. In contrast, the trees just die as a result of the damage, or become so crippled that they are out-competed by the shrubs and grasses. In a climate that is relatively dry, fires are more frequent and trees also grow more slowly and recover from damage with more difficulty. So climate and other factors can work in parallel against trees. The advantage usually turns from trees to low shrubs and herbaceous plants quite gradually along a climate gradient. The trees may get sparser and smaller, until there are just isolated individuals, and then none at all. Even where trees are mostly rare in the landscape, often there will be small stands of them here and there where there is a pocket of favorable conditions; for example, a little sunlit cliff in a cold climate, or in a dry climate where a spring emerges, or perhaps where there is a pocket of deep moist soil. However, sometimes there is a very sharp transition from forested or wooded vegetation to "open country'' such as grass or scrub. This may occur at the edge of a frequent grass fire zone, for instance: dead grass standing during the drier part of the year promotes the spread of fires set by lightening. The grass can tolerate fire because it just grows back from underground shoots after a fire, but any young trees establishing amongst the grass are usually killed.The grass fire will burn right up to the edge of the forest, beyond which the lack of fuel and the moist cool conditions prevent the fire from spreading into the forest. So the landscape will either be "all grass''—where any trees are killed by fire—or "all trees'' where the grass is shaded out by the dense closed canopy, with no gradation between the two. Such sudden transitions are often seen in savanna zones in South America and Africa, where islands of forest are surrounded by a grassy landscape, and one can step straight from dark moist forest to the dry heat of open grassland in a matter of yards. Forest islands also used to be seen at the edges of the prairie zone in North America, before settlers ploughed up the entire landscape for agriculture. Figure 2.16. Tree line on a mountain. Source: Gianluca Piovesan. 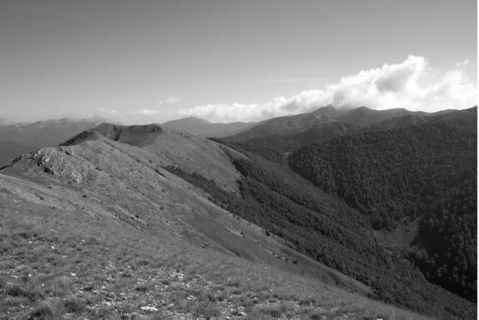 their slopes, better protected from winds and with adjacent mountains radiating infrared towards one another, rather than losing it to the sky. Differences in the aspect and slope angle, and also whether one is on the side of the mountain facing the sun or in shadow most of the day, also affect the position of the tree line more locally on a mountain. Which vegetation grow in a cool and dry climate? 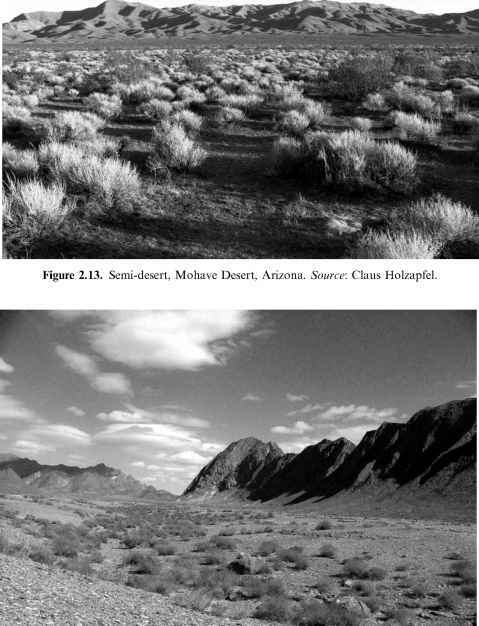 What vegetation is in a cold desert and how does climate and soil determine it? When does canada vegetation grown in cold biomes? How is the vegetation in cold homelands? 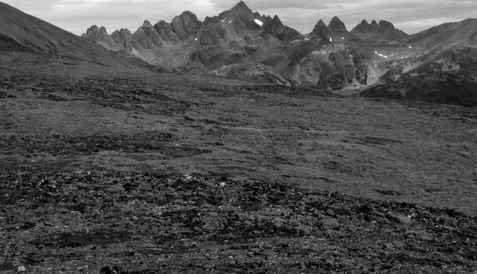 What types of natural vegetation in cold climates of high latitudes?